Homeowners have a lot of ramp options to choose from these days, ranging from extra-durable galvanized steel ramps to lightweight portable ones. For more information about the different types of home handicap ramps available, continue reading. If you want a ramp that is strong and that will last for years, look no further than one that is made from galvanized steel. These ramps are relatively easy to maintain and will not rust after being exposed to snow or rain. Because of their patterned-surface design, galvanized steel ramps are easy to walk on without slipping. 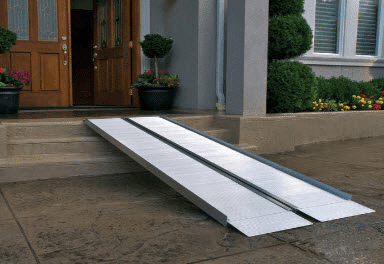 One of the most popular types of home ramps is the aluminum ramp. In addition to being incredibly durable, aluminum ramps can be set up on nearly any residential entryway. Depending on your preferences, you can either order a pre-made aluminum ramp or have one custom-built for your house. Portable ramps are useful for individuals who frequently go places and need to have a ramp with them at all times. These ramps can be set up on the walkway to the front door or be taken in vehicle to another location to be used temporarily. Fiberglass, aluminum, and heavy-duty plastic are some of the materials used for building portable home ramps. At Williams Lift Company, we specialize in installing handicap ramps in our valued customers’ homes. Whether you interested in getting an aluminum or galvanized steel ramp, our staff can put it in for you in a short amount of time. Call us at (908) 322-7070 today or stop by our website for more information about our services.